Hourglass Illusion Hyaluronic Skin Tint: I'm absolutely obsessed with this foundation, which I reviewed here. I love the creamy texture - it feels hydrating on the skin, glides over pores, gives medium coverage and that glow I love. It's also pretty long-lasting on the skin - needs touching up at around the 9/10 hour mark but that's pretty acceptable. If you have dry skin, you need to try this foundation. Hourglass is available from Cult Beauty/Space NK/Feel Unique/Selfridges/Arnotts/Harvey Nichols and John Lewis. By Terry Terrybly Densiliss Foundation: This foundation was on my wish list for the longest time & I recently took the plunge and bought it. There are 13 shades available and I bought Golden Beige, which is actually a little too light for my skin at the moment but when my tan fades, I think it will be perfect. This is described as an anti-wrinkle serum foundation and while I don't have wrinkles, I do have some fine lines and I have very dry skin, hence why this foundation was on my wish list. It contains 'mimetic factor' which is designed to encourage collagen production and improve elasticity so this foundation is skincare and makeup in one. It offers medium coverage but its buildable and doesn't cake at all. It literally glides over pores and fine lines to give the skin a smooth, airbrushed look. I wouldn't describe the finish as glowy but it does give a certain luminosity. It feels very lightweight on the skin and the lasting power is amazing - it doesn't break down at all or sink into fine lines and it doesn't need touching up throughout the day. It's a very expensive foundation but worth every penny in my opinion! 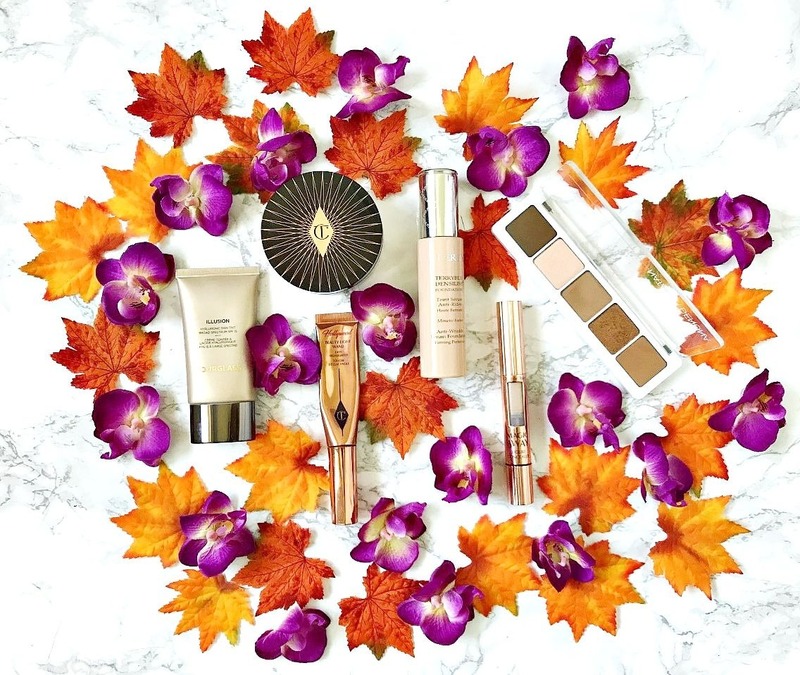 Cult Beauty/Selfridges/Space NK/Look Fantastic. Charlotte Tilbury Magic Away Concealer: I've reviewed this concealer on the blog already (here) but, in short, I love it because it erases my dark circles and any signs of fatigue but doesn't sink into fine lines in the under eye area and doesn't feel heavy on the skin. It creases ever so slightly on me but it's nothing a little dab doesn't sort out. I also love that I will be able to see when it's almost empty due to the clear panel on the side. Cult Beauty/Charlotte Tilbury/Arnotts/ Feel Unique/Selfridges/John Lewis. Charlotte Tilbury Genius Magic Powder: Why has nobody mentioned that this powder stinks? I actually threw a brush away the first time I used it because I thought it was the brush that was smelly? I'm really selling this powder, I know! The bad smell soon dissipates when it's applied to the skin so don't let that put you off because the finish of this powder is beautiful. It's undetectable on the skin and gives a smooth look whilst also blurring the appearance of pores. It doesn't cake or settle into fine lines - it's almost the perfect powder, apart from the smell!! Cult Beauty/Charlotte Tilbury/Arnotts/ Feel Unique/Selfridges/John Lewis. Charlotte Tilbury Hollywood Beauty Light Wand: I'm almost finished this tube of this stunning golden glow! It has a sponge applicator, which I either dab directly on to the top of my cheekbones or on to my hand and then apply to the face. It's a sophisticated highlighter - you won't be seen from space with it but it gives the skin a flattering sheen without highlighting fine lines. Cult Beauty/Charlotte Tilbury/Arnotts/ Feel Unique/Selfridges/John Lewis. Natasha Denona Camel Eyeshadow Palette: I know that this palette probably looks a little boring but I just love these shades for every day wear. The formula of Natasha Denona eyeshadows is the best on the market so they are very easy to apply and blend. A light hand is needed as they are very pigmented but they are honestly a dream to work with. Have you seen her new Gold Palette? It looks dreamy! Selfridges but Natasha Denona makeup is coming to Feel Unique soon! Have you tried any of these products? What are your current high end faves? I'd love to hear!